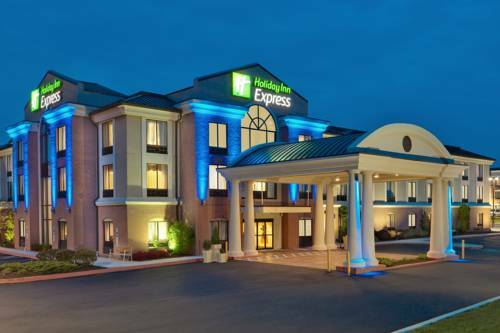 Enjoy Our Quakertown, PA Hotel's Historic LocationNestled in Upper Buck County, the Holiday Inn Express Hotel & Suites Quakertown boasts a great location, placing you in the midst of the city's historic charm and minutes from area attractions. Our property's elegant, sophisticated decor and thoughtful amenities also ensure that you can relax in comfort while away from home.As one of the leading hotels in Quakertown, PA, our facilities include an on-site Business Center, as well as a 336-square-foot meeting room. We are also near several area businesses, including Accu-Sort, Draeger, AGC Flat, Brown Printing Company and Knoll, making it easy to conduct business while in town.If you're in the mood to go shopping, be sure to check out Peddler's Village or the Promenade Shops at Saucon Valley, two top-notch shopping destinations in Quakertown, PA. Our hotel's guests can enjoy a fun-filled afternoon at Dorney Park and Wildwater Kingdom or take a day trip to the nearby town of New Hope. After a long day, you can also enjoy a spectacular show at Sellersville Theater.We are proud to provide free high-speed, wireless Internet access throughout our hotel's accommodations. While in Quakertown, PA, you can take advantage of the complimentary Express Start Breakfast Bar we serve daily. At the end of a busy day, you can enjoy a workout in the Fitness Center or take a relaxing dip in the indoor pool. We hope you book today, so we'll see you soon! Spinnerstown Hotel Restaurant and Bar offers a fine dining experience in a family friendly atmosphere. In addition to an exquisite menu, we offer a wide variety of beers from around the world. Relaxing environment. Separate bar area. Mid priced meals. World famous French Onion Soup. Pizza, subs and Italian dishes. Children's program - Dorney Park is an amusement park with rollercoasters, rides, fun, & food! On a hot day, head over to Wildwater Kingdom to find 22 water slides, three aquatic playlands, a water funhouse, two tubing rivers, two wave pools and other water rides. Sly Stallone as the movie boxer, frozen in bronze with his arms raised in victory. The Art Museum refused to put it at the top of its steps, where Rocky stands in the 1976 film. It's Philly's most popular work of art.